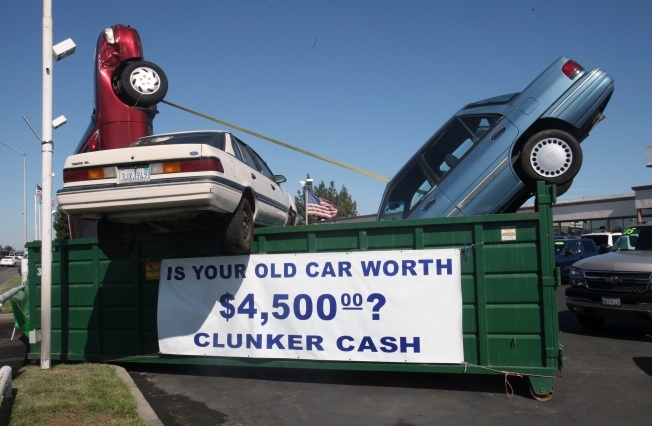 Used cars are seen in a dumpster to draw attention to the "Cash for Clunkers" program at Performance Chevrolet in Sacramento, Calif., Saturday, Aug. 1, 2009. On Friday Congress approved an additional $2 billion for the program that provides $3,500 or $4,500 credits to buyers who trade in older, gas guzzling vehicles for more fuel-efficient new cars. Senate Majority Leader Harry Reid (D-Nev.) said he has votes to extend "Cash for Clunkers," ensuring that the popular program will receive a $2 billion extension before Congress leaves for the recess. And Senate Minority Leader Mitch McConnell (R-Ky.), a critic of the program, seems to agree with him. "What I anticipate is that there will be a vote by the end of the week," McConnell said. "The matter will be completed by the end of the week." Even the most resistant Senate Republican, Jim DeMint, when asked if he'd filibuster cash for clunkers, said: "it's not my intent right now." DeMint says he will insist on a roll-call vote on the measure, instead of a voice vote. Cash for clunkers, a program created by the economic stimulus, provides $4,500 rebates for people who trade in gas guzzler cars for more-fuel-efficient vehicles. It was so popular that it ran out of money in its first week of existence. Reid made his prediction after the Senate Democratic caucus huddled for almost two hours at the White House with President Barack Obama in a bid to prepare for the crucial summer break. They spoke about their accomplishments in the first six months and the importance of continuing to work together to get a health care bill to the president’s desk by the end of the year, White House officials said. They also discussed energy and the cash-for-clunkers program, and the senators who talked with the media afterward said the meeting was positive. "The president didn't get one standing ovation but several," Reid says, comparing Obama to a coach. "We're ready to take on the world." Reid said their goal is still to do a bipartisan health care bill as long as they are able — even though Sen. Chuck Schumer (D-N.Y.) had said Monday that the Senate leadership was preparing contingency plans if a deal could not be struck by Sept. 15. "The preference is to do it together," Senate Finance Committee Chairman Max Baucus (D-Mont.) said. "Our hope is to get it done together." The meeting came as a handful of House members faced contentious crowds in their districts over health care and videos of those encounters went into wide circulation on YouTube. "There is a determination to get something done here," said David Axelrod, a White House senior strategist. "There is a good spirit in there, and I don't think it is just because it's the president's birthday." Manu Raju and Martin Kady II contributed to this story.